The Northwest Museum of Arts & Culture's new summer exhibit, 'Fangs, Fur & Feathers: The Art of Animals,' is on now and runs through September 4. Visitors will see more than 300 specimens, from leaches to terrestrial giants, grouped together in a spectacular 3,000 square foot display. Go to northwestmuesum.org for all the details. Rosauers has launched its own grocery delivery service, called Rosauers Delivers. It is available from three of its stores-at 2610 E. 29th, on the South Hill; at 9414 N. Division, on the North Side; and at 10618 E. Sprague, in Spokane Valley. Each store delivers within a three-mile radius, up to 27 deliveries a day, 11am to 8pm, for a $9.95 delivery fee. Order your groceries, including tobacco and alcohol at RosauersDelivers.com. Old World Christmas will be opened for their annual 'Christmas in July' sale through the month. Hours are Monday through Friday 11am to 3pm. Their outlet store is located at 4005 E Main between Sprague and Havana. During the 10th annual An Evening In Tuscany benefit for the YWCA Spokane coming on July 8, the annual Sir Lancelot award will be given to long-time YWCA Spokane supporter, Gina Lanza. Gina is a well known Chef and the previous owner of Amore Italian Restaurant and the Anaconda Grill. In 2005, Gina's involvement with the YWCA Spokane started through volunteering her time in Our Sister's Closet, the YWCA's donation-based, free clothing boutique for women. Shortly after, Gina offered to facilitate a cooking class to raise money to purchase hygiene supplies for Our Sister's Closet. Her class was a huge success and spurred the inspiration to create something more. The following year, An Evening In Tuscany was born, and became an annual source of support to meet the needs of the women and children living in the YWCA Spokane's domestic violence safe shelter. An Evening In Tuscany has grown from an intimate dinner to a beautifully established benefit, now four times the original size. With Gina's help, this annual fundraiser for the YWCA Spokane has raised $75,000 over the last 9 years. July 8 at the new 'An Evening In Tuscany' benefit location, Barrister Winery, 1213 W Railroad Avenue. More information can be found at www.ywcaspokane.org. 1. $10,995.66 technology grant to Providence Health Care Foundation Eastern Washington for the Providence Sacred Heart Medical Center School of Medical Laboratory Science for an RX Monza chemical analyzer. 2. $2,500 education grant to Wenatchee Valley College Foundation to launch the Blood Center Foundation of the Inland Northwest Medical Lab Technician Scholarship for the 2106-17 school year. 3. $16,000 education grant to Providence Health Care Foundation Eastern Washington for the Providence Sacred Heart Medical Center School of Medical Laboratory Science Student Scholarships for the 2016-17 class. 4. $3,308.50 technology grant to the Inland Northwest Blood Center for computer classroom equipment. 5. $12,000 technology grant to the Inland Northwest Blood Center for Bedside Transfusion Verification at Rockwood and Providence Hospitals. These new grants, totaling nearly $45,000, bring total Blood Center Foundation of the Inland Northwest total giving to $273,400 since the organization launched in November 2013. The organization is the fundraising arm of the Inland Northwest Blood Center, raising funds and investing funds in the 150-mile radius around Spokane including North Idaho, the Columbia Basin and the Lewis-Clark Valley. NUDO Ramen House which is located across from the Davenport Hotel at 818 W. Sprague Ave. is taking about 2,800 square feet of the former Shakey's Pizza Parlor, 9602 N. Newport Hwy location and is slated to open late August. NUDO will have indoor dining as well as an outdoor patio. Sweeto Burrito, which opened their first restaurant in Spokane last year at 15705 E. Broadway in Spokane Valley, will take about 2,700 square feet in the north side of the building and is planning an early August opening for their new location which will have inside seating as well as a drive through. Spokane Teachers Credit Union (STCU) has recently announced plans to open a new branch location with a view of Coeur d'Alene’s McEuen Park. Remodeling is scheduled to begin this summer at 401 Front Avenue, Suite 100, in downtown Coeur d'Alene. STCU is leasing the former Bank of America branch from Blackridge Properties, with Nystrom Olson Architects handling design work. The STCU Downtown Coeur d'Alene Branch is slated to open in late 2016 or early 2017. 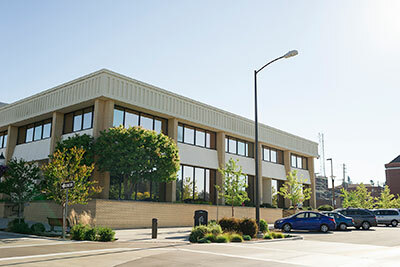 "STCU is excited to offer a convenient downtown branch location for members who live or visit Coeur d'Alene," said Tom Johnson, STCU president and CEO. At 3,600 square feet, the new branch will be similar in size to the STCU Crossroads Branch in Coeur d'Alene, which opened in 2015. The Downtown Coeur d'Alene Branch, with a drive-through and ATM, will have a staff of five to seven. STCU currently has 18 branch locations, including 14 in Washington and four in North Idaho. That will grow to 19 branch locations in August, when the STCU Qualchan Branch is scheduled to open in Spokane's Latah Valley. The Downtown Coeur d'Alene Branch will be STCU's 20th location. The KXLY Broadcast Group has teamed up with Kiemle Hagood to develop approximately 15 acres of property on the upper South Hill where Regal Street meets the Palouse Highway. The Southeast Sports Complex, the largest park on the upper South Hill, is surrounded by commercially zoned properties on three sides, so neighbors say whatever development takes shape on the land owned by KXLY needs to embrace the existing park and blend recreation with retail shopping and involves more aesthetics and less asphalt. Plans call for building retail shops right along Regal with a set-back sidewalk that will separate cyclist and walkers from traffic. The architect envisions a pedestrian village that's as much a destination as it is a place to shop. Developers say they plan to put in enough trails and broad sidewalks to allow nearby residents bike or walk their way into the complex and ease congestion on Regal Street. The project won't move forward unless the Spokane City Council approves selling KXLY a two-acre piece of property, which won't happen until the public comment period is over on July 11. If that sale goes through, a new road will cut into the existing parking lot and a little bit of a soccer field. The developer, however, plans to replace the soccer field and the parking before the existing ones are demolished so players and their families are not displaced by the construction, which could get underway by this time next year. Associated Industries announces the addition of two human resources team members, Amy Valles and Hannah Sullivan. Amy Valles has joined the team as a human resources advisor and is now serving members with individual support, outsourced resources, and HR projects. Amy has an MBA from the University of New Mexico in Albuquerque and has experience working in HR for government agencies. Hannah Sullivan is a graduate of Gonzaga University and worked for their internal HR group before joining the Associated Industries team as a human resources generalist. She is currently supporting members and clients with hiring and onboarding functions. Artisans, a non-profit agency that provides employment opportunities for persons with disabilities, is partnering with Men's Wearhouse, one of North America's largest men's specialty retailers, to launch its ninth annual National Suit Drive, a month-long initiative, now through July 31, that encourages donations of gently-used suits and professional attire. Clothing collected from the drive will be distributed to Artisans and more than 180 other local nonprofit organizations that provide job ready skills and training to unemployed and underemployed men in the Spokane area and across the United States. Over the past eight years, Men's Wearhouse has collected over 879,000 professional clothing donations nationwide to support unemployed individuals seeking to re-enter the workforce and this year, the goal is to collect another 150,000 clothing items. Now through July 31, residents of Spokane can donate their gently-used clothing, including men's and women's suits, ties, jackets, shirts, pants, belts and shoes, at 5005 N Division #105/106. As a thank you, donors will receive 50 percent off their next purchase from Men's Wearhouse (excluding shoes, clearance and Exceptional Value items).